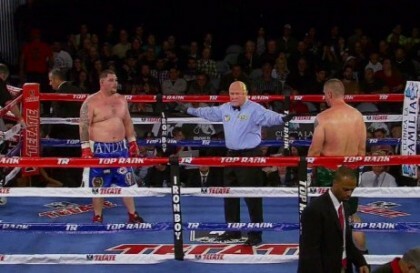 Andy Ruiz Jr to make ring return next month; you’ll never guess who against! One of the more interesting heavyweights out there, unbeaten Andy Ruiz Jr, has not yet seen his skills tested at the highest level; or anything approaching the highest level to be perfectly honest. This doesn’t mean Ruiz, 26-0(17) and hailing from California, cannot fight, he most certainly can. Possessing fast hands, power and, despite his bulky physical appearance, a good engine, the 26-year-old has impressed his share of fans and experts. We just don’t yet know whether or not Ruiz – who hasn’t fought since last October and who has boxed just twice in the past 17 months (although he did box in both September and October of last year) – is world class. And we will not find out in Ruiz’ next fight, set for May 14th. Ruiz will face…..(drum roll)…..Ray Austin. That’s right, “The Rainman,” a now 45-year-old one-time contender who has not fought since 2014. This is the word according to Dan Rafael of ESPN.com and Ruiz and Austin will rumble in Studio City, CA on May 14th. The fight, an eight-rounder, will support lightweights Saul Rodriguez and Daulis Prescott who will meet in the headliner. Although Ruiz is coming back to action following his being forced to pull out of a fight because he was “not mentally ready,” according to his promoter Top Rank, it’s tough to defend this match-up. Austin, 29-6-4(18) was a good fighter a decade or so ago, even getting as far as challenging Wladimir Klitschko in a heavyweight title fight in 2007 (being stopped in the 2nd-round). But today, after having fought just once since being stopped by Bermane Stiverne in June of 2011 (the win, a points victory, coming over a 15-22-1 Earl Ladson in February of 2014) what can Austin possibly do against the man almost two decades his junior? Ruiz looked very promising in 2013, when he was knocking off fellow prospects Joe Hanks and Tor Hamer. A 2014 win over former WBO champ Siarhei Liakhovich was also a useful win for Ruiz but since then he has fallen under the radar somewhat. What can we expect on May 14th? Ruiz could score a blast out, or, if he is in shape and has some ambition left, Austin might stick around to hear the final bell. Either way, Ruiz has to be the pick to win. This fight will see the contender shake off some rust and restore a little self confidence, but nothing more. You are here: Home / Boxing News / Andy Ruiz Jr to make ring return next month; you’ll never guess who against!